A prevention against obesity, diabetes, hypertension, digestive disorders and several types of cancer, the Mediterranean diet is considered one of the healthiest diets in the world, ideal for keeping fit and well-balanced. It is characterized by a great use of vegetables, cereals, fresh fruit and olive oil as the main source of fat, frequent consumption of fish, minimal consumption of meat, and a small amount of wine during meals. The diet has its origins in the Italian history and tradition, while the specific term dates from the early post-war years, when it was noted that the incidence of cardiovascular disease in Greece was significantly lower than that in the United States. The American doctor Ancel Keys theorised that this difference was a result of the different dietary habits observed in the two countries. He was so convinced of the benefits of the nutrition and lifestyle typical of Italy and other Mediterranean countries, that he moved to live in Pioppi, a small town of Cilento, a region of healthy southern Italy. The verification of his thesis was obtained with a study (begun in the 1950s) which drew comparisons between lifestyles of the populations of seven countries: Finland, Holland, Greece, Italy, Yugoslavia, Japan and USA. study confirmed the relationship between diet and health, and followed the incidence of various diseases, in particular clarifying that the type of fat used, and not the quantity, had a greater influence on the development of cardiovascular diseases. 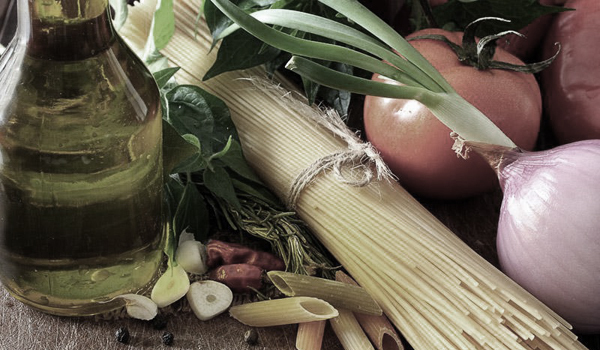 Since then, the Mediterranean diet has been considered an ideal model for maintaining good health. ingredients used in every dish. and appliances, but with seemingly less important devices such as cooking thermometers and the modern techniques of vacuum packing, which are crucial for creating a food pantry of the highest quality. Knowledge of the rules of ingredient combinations is the key to culinary success. dishes within the bounds of a healthy diet. discussion and appreciation of the meal.